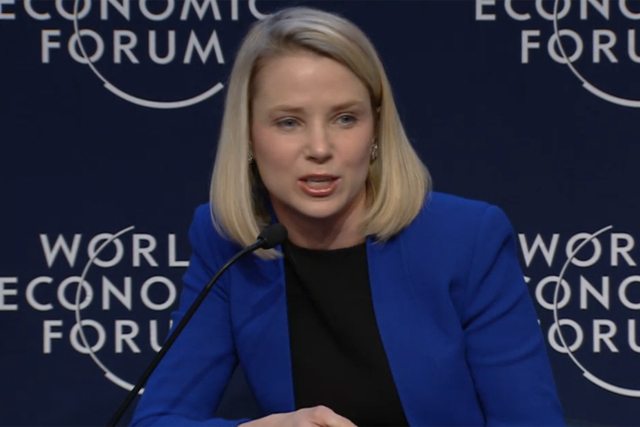 Yahoo chief executive Marissa Mayer believes the Internet of Things and mobile will create a "tipping point" for businesses in 2014 that will change everyone's lives "like never before". Speaking at a panel discussion hosted by Forrester at the World Economic Forum (WEF) in Davos, Mayer also cited how "sharing economy" apps are revolutionising the world. She said: "150,000 people let strangers stay at their home last year through Airbnb; 1.5 million people assigned tasks to strangers through TaskRabbit; 56 percent would consider renting out their cars to strangers. "The Internet of Things makes connecting and trusting people easier. Part of this is the sharing economy, but through Internet of Things and mobile we can inspire and entertain people like never before." The" tumultuous environment" will mean 2014 will be a "crossover" for Yahoo as it expects to have "more mobile traffic than PC traffic", according to Mayer. The panel of chief executives, which also included BT boss Gavin Patterson, AT&T chief executive Randall Stephenson and Cisco chief executive John Chambers, also discussed the issues of privacy in the context of the Edward Snowden revelations. Patterson said it was unlikely consumers would now ever have 100% privacy, because this would "mean zero percent security" and he believes legislation needs to "catch up" with technology to alleviate the pressure privacy concerns are exerting on BT’s business model. He said: "The legislation has to catch up with technology. It is often several years behind and it’s not fit for purpose today. The internet plays a role in protecting us, but I’m not sure legislation has kept up with where we’re at today. "It’s too murky at the moment. It’s unlikely we’ll achieve 100% privacy, because people understand the need for security. Clear guidelines are needed on what is acceptable"
Mayer added: "We want to help our users understand how many requests we’re getting [from the National Security Agency]. "We need to be able to build trust with our users. Not only within the US, but also internationally, there are concerns about what the NSA is doing." PricewaterhouseCoopers also unveiled the results of its 17th global chief executives survey at Davos, which found 72% of respondents said regulation was their main concern, superseding global economic concerns.